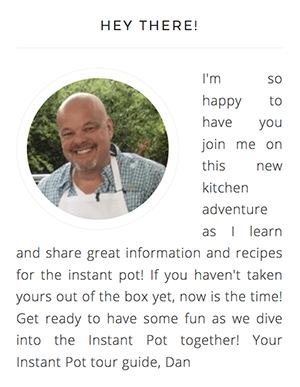 You are here: Home / Instant Pot Article / Which Instant Pot is Right for Me? The Lux Instant Pot is the base model and it is the one that we use (for now). It is a six-in-one cooker that can sauté, make rice, steam, pressure cook, slow cook and keep warm. It does not have a yogurt maker and although the Lux is the basic Instant Pot Model, it is a powerhouse kitchen appliance. Oddly enough, at the time of this article, the Lux is priced higher (on Amazon) than the next model (the Instant Pot Duo) which has more features, including a yogurt maker. This seems to make the choice between the two an easier decision when you ask, “Which Instant Pot is right for me”? The Duo Instant Pot does everything the Lux can plus it makes yogurt. It also has a two-setting pressure setting (high and low) and the handle has a nifty lid holder. 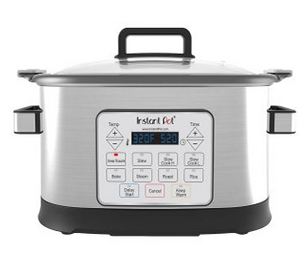 For most Instant Pot newbies and depending on the price compared to the Lux, this is the model I would recommend and it also happens to be the best selling Instant Pot out there. Buy it on Amazon here. The Instant Pot Smart Bluetooth model performs all of the functions of the Lux and the Duo, with some techy additions that come with a higher price tag. This model can program sequential temperatures and times for different recipes and a few more advanced options. If you enjoy the higher tech side of cooking, this may be your Instant Pot but be prepared to shell out a bit more bank for it. Like all things high-tech, the Instant ant Pot Smart model has a history of glitches with software compatibility which seems to have been largely resolved by the manufacturer. 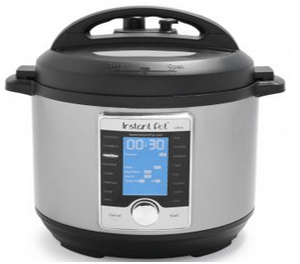 You can pick buy the Instant Pot Smart here. 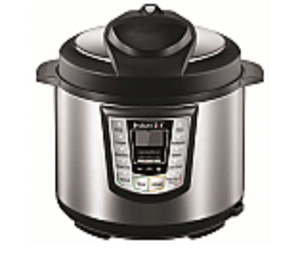 The Duo Plus Instant Pot is as it’s name might suggest, an upgrade of the Duo Instant Pot. In addition to the functions of it’s namesake, the Duo plus has a sterilize function as well as an egg and cake program. 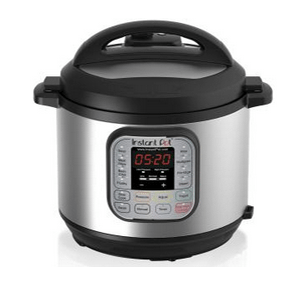 Instant Pot calls this mode a 9-in-1 mulit-cooker. 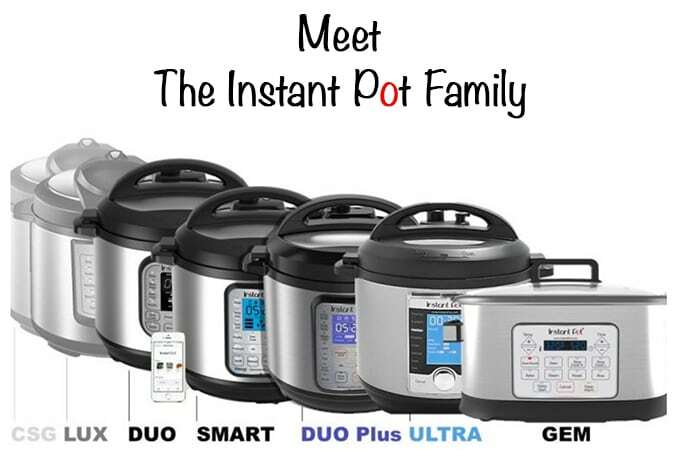 Purchase the Duo Plus Instant Pot here on Amazon. The Ultra Instant Pot is a jazzed up version of the Instant Pot’s finest features. The cook can adjust temperature setting in one degree increments and the display and controls are updated with such features as a larger display and a rotary dial control. The steam setting has a non-pressure option which will preserve the al dente character of steamed vegetable, making many home cooks even happier campers. Like many fancy camera, the Ultra Instant Pot also has a “start” button so users can use it without having to worry about the more involved tinkering. 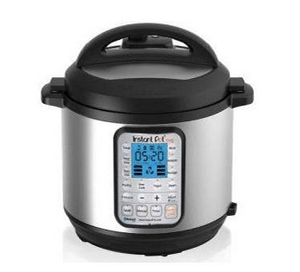 You can buy the Ultra Instant Pot here on Amazon. 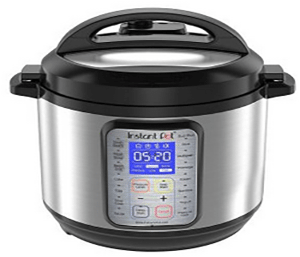 Every family has at least one member that is very different from the rest of the sheep, that is the case with the Gem Instant Pot. When asking, “Which Instant Pot is right for me?”, keep in mind that essentially the Gem is a fancy slow cooker. It has no pressure cooker function and it does not make yogurt. Aside from those big differences, the Gem will allow the cook to sauté, steam, roast, bake, stew, rice cook and slow cook (on two temperature settings.) Also, the Gem has an inner liner that has a non-stick coating. If the Gem is something that you find appealing, you can get it here on on Amazon. 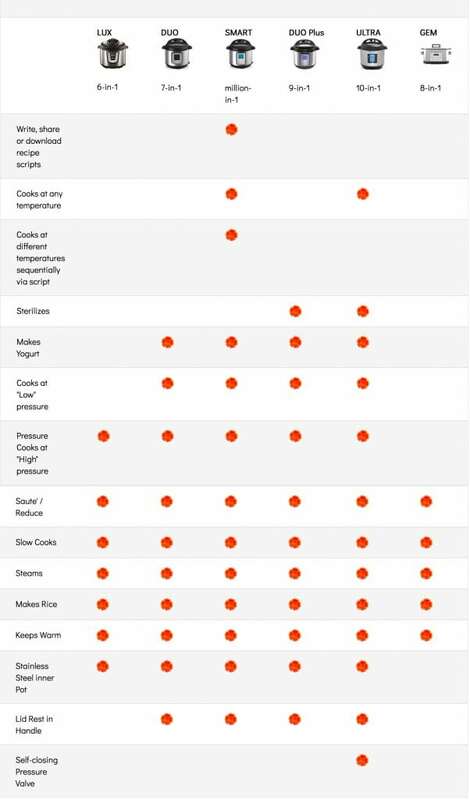 This above table from Chip Cooking does a nice job of comparing the various models of the Instant Pot. Our site makes a small commission on any purchase you make through Amazon and we always appreciate your support by using our links. Thanks for reading our site, please follow us on social media and please share us with your friends and family! I have an IP-LUX 50 v2 6 in 1 Programmable pressure cooker that does more than you list for a 6 in 1 model. For example, it does make yougart. Thanks Patrica, this was news to us and after doing a little reserarch, the IP-LUX60 is an updated version of your model and in addition to lacking the yogurt making function of your earlier model, the LUX60 has a larger capacity and can operate at a slightly higher energy level of 1,000 watts, as opposed to 900 watts in the earlier version. 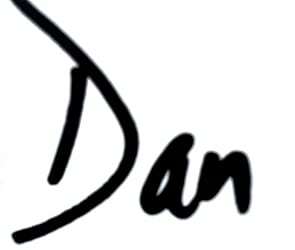 Thanks for pointing this out!